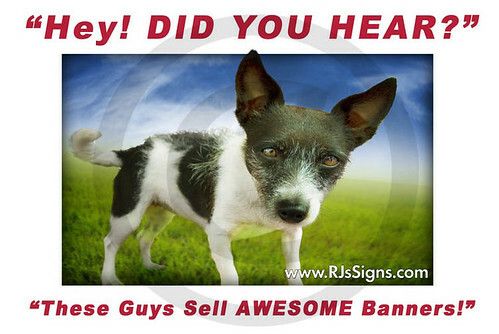 Below are sample photos of our vinyl sign banners. For more photos of custom banners, signs, vehicle graphics and more, including: stickers, decals, labels, and window lettering, check out our Portfolio. Manufacturer labels to Murals. Big or small, we print them All! Our products and services are purchased by both personal and professional use clients. Below are sample uses of our wide format inkjet printing products and specialty displays. Indoor or Outdoor Banners for business, or party! Indoor or Outdoor Signs and Displays. Over-sized full-color cutouts! Get Attention in a Very Big Way. Manufacturer and Equipment Safety Labels and Decals. Team Logos, Decals, and Equipment Labels. Computer, Cellphone, and Ipod wraps and graphics. Full-color wall art, murals, and border trim. Magnetic signage for vehicles, metal cabinets and doors. Canvas Art reproduction and Photo Enlargement. Posters, Presentations, Court Room Displays, Artist Renderings. One-way vision graphic film for windows. Also known as view-through. Reflective graphics, lettering, striping, and decals. Specialty displays and campaign themes. Floor graphics, advertising, markings and lamination. Store Front and Window lettering, graphics, and complete wraps. Logo design and campaign layouts. Translucent Graphic Prints for back-lighted sign panels. Product labels and decals. Extensive detail — NO PROBLEM! For more photos of custom vinyl sign banners, signs, vehicle graphics and more, including: stickers, decals, labels, and window lettering, check out our Portfolio.